Wholesale Distributor of a wide range of products which include c & z purlins. 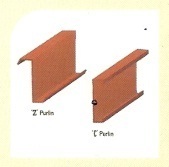 We are engaged in Suppling of C & Z Purlins. These are revolutionary products which have been technically approved and accepted all over the world by architects and engineers. Its extraordinary shapes increases its strength and load taking capacity. Usage of Z purlins results in cost saving upto 50% in structural steel as compared to traditional rolled section (Like Angle / Channel / Beams) And hollow sections like (Round Pipes / SHS / RSH. ) It is available in customized lengths, Thus there is no need of any fabrication, cutting or welding at the site. Hence there is no material wastage or fabrication cost. It is also available in various thickness and sizes. The customers also has the option to buy high quality Galvanized Z purlins. Looking for C and Z Purlins ?